Farmington drivers rely on their vehicle's coolant system to keep their engine cool. Coolant (also called antifreeze) mixed with water flows through your vehicle engine and absorbs heat. The mixture then flows out to the radiator where it's cooled by air flowing over the radiator. From there the coolant/water mix circulates back through the engine to absorb more heat. There's a reason we mix coolant and water. Water alone actually does a good job transferring heat from the engine. The problem is that water boils at a temperature that's easily reached inside your vehicle's engine, so it can turn to steam which does not conduct heat as well and is harder to contain. Also, if it's freezing outside in Farmington , the water in your engine could freeze while your vehicle is sitting out in the Michigan cold. So, if you remember your high school chemistry, you'll know that a mixture has both a higher boiling point and a lower freezing point than either component alone. Coolant, or antifreeze, is specially formulated to keep your engine safe in a wide range of environmental and operating temperatures in and around Farmington . Whenever your vehicle is running, the coolant in the cooling system is working to keep your engine from overheating. When it's cold outside, the coolant acts as antifreeze to keep the fluid from freezing in your engine. All that exploding fuel in your engine creates a lot of heat. Without coolant, the metal vehicle engine parts would expand so much that the engine would seize up and stop running. The parts could be broken or warp so badly they would have to be replaced. It could even be so bad that the whole vehicle's engine is ruined and has to be junked. This is why it is critical that Farmington drivers check coolant levels frequently and have their vehicle's cooling system inspected for leaks. Also your vehicle has a maintenance requirement for draining and replacing your coolant. These recommendations can vary widely, so check your owner's manual or ask us at Darrell's Firestone in Farmington . The reason Farmington drivers need to change the coolant is that it has additives in it to protect the cooling system. As you can imagine, with all the heat, the cooling system's a pretty harsh environment. The additives keep the fluid from becoming corrosive and damaging the radiator and other vehicle cooling system components. Over time, the additives are depleted and the coolant just has to be replaced. 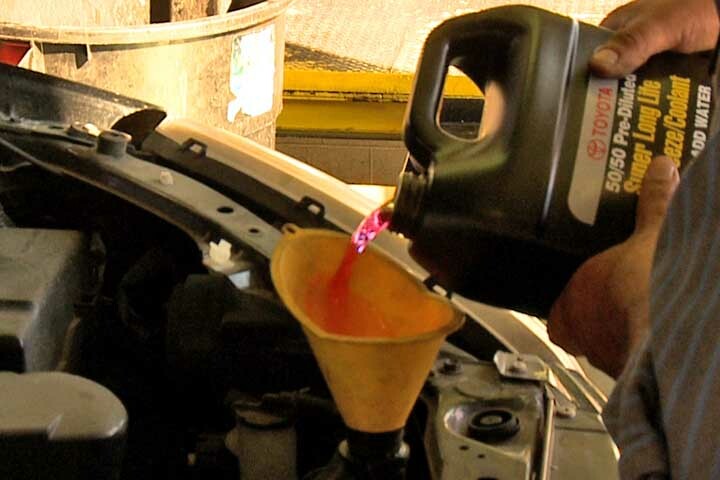 Many Farmington auto owners ask our advisors at Darrell's Firestone why there are different colors of antifreeze. It is very important that you use the correct type of antifreeze. The different types of antifreeze – or coolant – are different colors so you don't mix them up. They use different materials to make the cooling system, and they require different types of antifreeze to protect them. So check with us at Darrell's Firestone in Farmington or your owner's manual for the right kind because using the wrong coolant can void the warranty for your vehicle cooling system.